Before my surgery I was very depressed about not being able to lose weight and keep it off. I was insecure because of how I saw myself in the mirror. Being overweight at a young age is not good for an active social life, and I knew that I needed to do something before I put myself at risk for serious medical issues. My father's side of the family has a long history of diabetes and it was only a matter of time before I kept the tradition going. The event that made me want something better for myself was going through the metal detector in a federal building. The guard asked me if I was "with child.” I was so caught off-guard that I asked her to repeat herself and she repeated, "Are you with child, are you pregnant?" My response was, "No, I'm just fat!" I was so disgusted with myself and embarrassed. I went through several different weight-loss fads, and failed them all. After seeing a TV show about weight loss surgery, I finally looked into it. I chose to weigh the good against the bad and the bad outweighed the good and a change had to be made. After researching the website I attended a seminar, and that very day I knew that this was the step I needed to take for my life and health. Barix has been a great experience. If I ever have a question, someone was ALWAYS there to answer it, or point me in the right direction. They offer great support groups and newsletters to help keep me motivated. 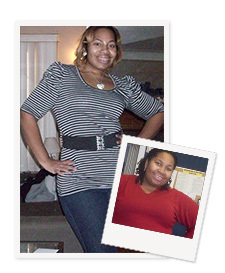 I loved that some of the staff shared their stories with me about their weight loss success. They assured me that I was not the only person who has had a weight problem. They are always pleasant, and that is the type of atmosphere you need on this weight loss journey. What can I say? Having the RNY surgery was such a positive event in my life, because for the first time I feel like I'm REALLY ME! My overall health has improved 100%! I'm not at my goal as of yet nor at my doctor's goal—HOWEVER, if I had to stay at this weight I would be okay with that. I'm grateful that I am NOT where I was and the journey has been an AMAZING one. I have lost over 120 pounds. I have converted my faith, and married my handsome husband. I wouldn't change a thing and I am so happy that I was given the opportunity to get my life back on track. Now I look forward to starting my new life with my new family. I am so happy that I chose to have the weight loss surgery and I do not regret one thing. Now I feel SOOO much better and have the energy that someone my age should have instead of the stamina of someone twice my age. DO YOUR RESEARCH!!!! This decision has to be YOUR decision only! Don't do it to satisfy others, do it to improve your overall life. This is a MAJOR operation and something that should NOT be taken lightly. It is a mind journey as well as a weight loss journey.